Located on the 122nd floor of the world’s tallest building, Atmosphere offers incomparable, breathtaking views through floor-to-ceiling windows. You can get dressed up to come here and not feel out of place in dazzling surroundings – it’s definitely a spot to celebrate, treat your loved one, or impress guests. Expect pristine white tablecloths and elegant, chic décor. The dimly lit restaurant makes for an intimate, romantic experience – and allows the city’s lights below to sparkle and shine gorgeously. Led by executive chef Christopher Graham, the kitchen here ensures that well-thought-out food takes center stage. Although there are various tasting menus available, ranging from eight-course to three-course, with and without pairing, we are here to try the newly launched Harvest Menu, which showcases beautiful seasonal produce from around the world. Zesty aromas kick-start the experience from a dish of home-smoked mackerel with green apple, radish and horseradish. An aromatic risotto with tomato jelly and pu’er tea follows, which is light and satisfying. Two main courses come next, with pan seared bream served first, topped with fennel and a side of spiced aubergine. The slow cooked duck break is next, and pairs beautifully with poached pear, foie gras, cherry and vanilla – an incredibly moreish and wholesome dish. Lastly, a dessert of apple tart perfectly concludes the excellent dining experience, accompanied by velvety crème brûlée ice cream. Extremely professional and welcoming, ensuring a refined and enjoyable experience was had by all. This is a place to go when you’re looking for an experience to remember. 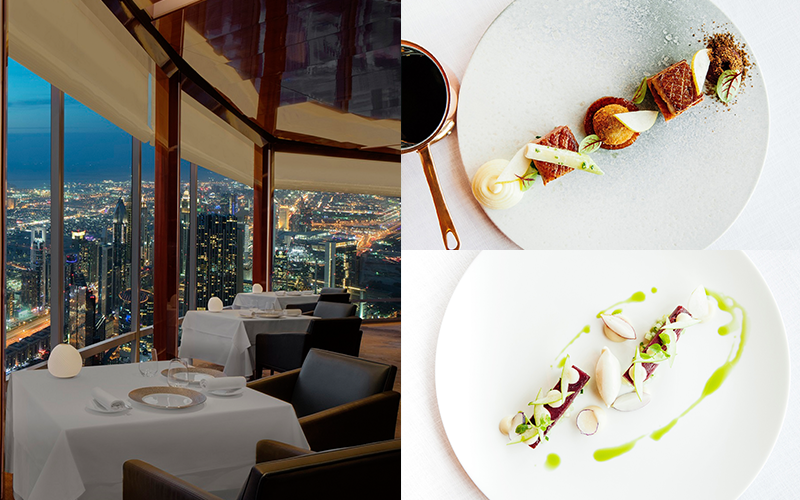 Atmosphere provides an infallible dining experience in the sky to share with those closest to you. Details: The Market Menu is priced at AED 495 per person for five courses, without beverages. Call 04-8883828 or e-mail atmosphere@atmosphereburjkhalifa.com.